Three of the six men left seriously ill by a drugs trial have been taken off organ support, doctors have said. Doctors at Northwick Park Hospital, in north-west London, said on Sunday they were encouraged by the progress of four of the men, who were fully conscious. Another two volunteers remain in a critical condition and under sedation, but have also made improvements. 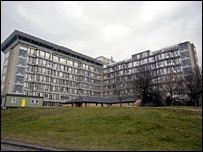 The men were taken ill on Monday after taking part in a drugs trial at a facility next to the hospital. Dr Ganesh Suntharalingam, head of intensive care at Northwick Park, said: "We are continuing to make advances with treating the four seriously ill patients, and we are encouraged by their progress and recovery to date. "All four are improving and we have now been able to remove artificial organ support from three of them. "The two other men are still in a critical condition. "They are under sedation for their own comfort while they receive organ support." Four of the men suffered multiple organ failure within hours of taking the drug TGN1412. The case is being investigated by the Medicines and Healthcare products Regulatory Agency (MHRA), which has seized documents and sealed off offices. Scotland Yard said officers were talking to the MHRA and doctors. Staff from Parexel, the firm carrying out the trial, insist the right procedures were followed.